Welcome to this month's Carers bulletin. 2019 will be an exciting year for Coventry as it marks the Year of Wellbeing and Coventry will also host the European City of Sport in 2019 with lots of events and opportunities to be involved in the new year. However you wish to spend your time over the festive period we want to wish you a peaceful and enjoyable time, surrounded by the ones we love. We know for many people Christmas can also be a difficult time of year. This month's bulletin focuses on some of the activities going on in the city to keep those who might be isolated connected over the festive period. 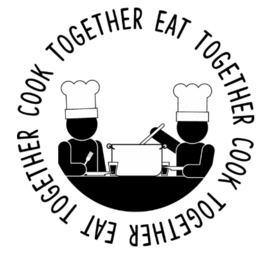 The Cook Together Eat Together Team are hosting a free six week cooking club in the New Year. The course starts on Thursday 17 January - 2.30pm to 4.30pm at the St Peter's Centre in Coventry. The course is aimed at Coventry residents aged 55 and over. It's an opportunity to make new recipes and meet new friends. If you're interested in booking a place you can contact the service on 0800 464 0699 or visit their website. Coventry City Council’s Adult Social Care Services will be sending out anonymous postal questionnaires between the months of January and February 2019 to a random sample of people who are in receipt of long-term support from Adult Social Care. 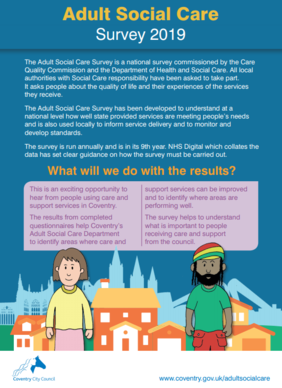 The Department of Health uses the survey information to inform and support policy and decision making at the local and national level; to improve care, services and outcomes for local populations; and to help carers make better choices about their support. If you do receive a survey it's your opportunity to feedback what has worked well and what we can do better to improve experiences. 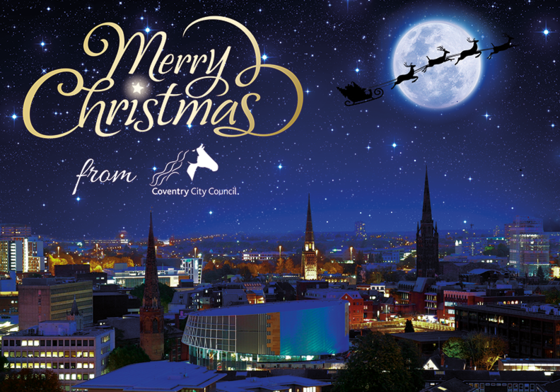 The Council will be closed between 24 December and 2 January 2019. Essential services will still be maintained. Adult Social Care (024 7683 3003) and Children's Service (024 7678 8555) will be available for urgent enquiries during office hours (excluding weekends and bank holidays). The Carers Trust Heart of England Wellbeing Service located in the library will also be closed for the duration of the holidays but will be running a Telephone Helpline on 024 7610 1040, between 10am – 2pm, on Christmas eve (Monday 24 December), Thursday 27 December, Friday 28 December, and New Year’s Eve (Monday 31 December). Cyrenians - Christmas Day Meal - 25 December 11am-3pm, Methodist Central Hall. For anyone who may be homeless, isolated or lonely over the Christmas period. For more information you can visit the Cyrenian's website. Coventry Open Christmas - 24-29 December - Queens Road Baptiste Church, will offer breakfast, lunch and dinner for anyone sleeping rough or homeless over Christmas. Trussell Trust - Food Bank support - Coventry Foodbank will be closed from 24 December and will reopen on 2 January. During this time emergency food boxes can be collected from 4 fire stations; Binley, Foleshill, Canley, Radford. Belgrade Theatre - Sleeping Beauty (Relaxed Performance) - Thursday 3 January - 2pm. A relaxed performance is specifically designed to be an open and welcoming environment for those who may benefit from a more relaxed performance style, including those with Autism Spectrum Conditions, sensory and communication disorders,learning disabilities and dementia. To find out more you can visit the Belgrade website.